If you need mobility in the lab with all the needs at the time you perform the works, these lab carts are your answers. This mobility storage cart is the perfect unit for your lab. Made of HDPE, and comes with the roll top door offers additional safety over traditional doors. 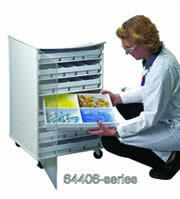 White Polyethylene Extra Wide Storage Cart provides 3 oversized drawers and an extra large 36 x 17 inch work surface. It features a bulk storage area and a lockable sliding door. Made from half inch high density polyethylene and rugged ABS, this cart is tough. It's easy to push and pull using the cutaway handles in the top. White always says clean and it stays that way too because it's chemically resistant and can put up with the harshest abuse you can dish out. Its easy mobility and professional appearance will create instant neatness in your work area. Large storage area with extra wide drawers and compartments, heavy-duty casters with two locking. High capacity deluxe cart – offers versatility along with more than 17ft2 of movable storage space. Store the most commonly used lab supplies in this lab saving space cart. Polyethylene Core SP Space Saving Lab Cart provides a large amount of extra storage and workspace in a small footprint. This cart carries almost three times its weight and the innovative sliding door provides access to your supplies in cramped rooms or tight hallways. The door locks in either the up or down position with an embedded security lock and comes with two keys. Keep supplies and other equipment in one of the three full-extension drawers or bulk storage area. Built in ergonomic handles make the Core SP easy to maneuver. 2-Sided Hourglass Light Duty Cart delivers heavy duty performance. Finally a cart that offers high value mobility at a low price point. Don't let the sleek and elegant design fool you, this cart is rugged in structure, function, and capabilities. Made from a durable aluminum polyethylene composite material, the 2-Sided Hourglass 2-Sided Light Duty Cart is light in weight and strong in function. With a unique 2-Sided design, you can access the durable polystyrene trays from both sides. The large 22 x 11 inch HDPE top offers a spacious chemical resistant work surface that is easy to clean. White Polyethylene Lockable Narrow Lab Cart is only 12 inches wide. It has a locking roll top (tambour) door that disappears when open and is constructed from durable, chemically resistant high density polyethylene. This lockable cart comes with 2 keys and has 6 removable drawers. Four 3 inch casters, 2 with brakes. Six-drawer cart uses our exclusive drawers to make finding tools and supplies painless. This heavy duty six drawer cart comes in two sizes to fit our drawer organizers. Constructed of HDPE, it is designed to hold heavy items, but flexible enough for any application. Acrylic clear door keep dust out while casters are helped mobility. The seven shelf cart is similar construction as six shelf cart. It accommodated seven shelves. Shelves are made of ABS plastic, which is 100% water repellent and withstand tough abuse. 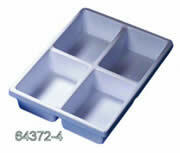 For compatible tray options see our 64370 series. White Polyethylene Core CL Cart with Clear PETG Door has versatile storage options. Features 6 large bins, 3 full extension drawers, tool holder with log book holder, and large bulk storage area. Easy to grab handles are good for pushing or pulling. White Polyethylene Core CL Suture Procedure Cart consolidates and organizes sutures for easy retrieval for wound treatment. Features 6 large bins, 3 full extension drawers, tool holder with log book holder, and large bulk storage area. Easy to grab handles are good for pushing or pulling while 4 heavy duty 4" casters make rolling a breeze. Made of white polyethylene, ABS and PETG construction. EMS introduces the new Core DX Lab Cart to organize your lab supplies and easily transport documents, glassware, chemicals, pipettes, samples, squeeze bottles, gloves and wipers. The food-grade high density polyethylene construction is rugged enough to withstand years of laboratory use. The Core DX Cart is the ideal lab cart for laboratory workers, doctors, and anyone else who frequently stores and moves supplies from place to place, The EMS Core DX is engineered with toughness in mind. The 60-pound cart is made of sturdy rustproof polyethylene and ABS, with built-in handles in the corners to push and pull with ease. As a result, both tall and short users can comfortably maneuver the cart. The 3-inch, non-marking rubber wheels, meanwhile, roll smoothly on virtually any surface, from concrete to tile to vinyl to carpet to linoleum. Best of all, the cart provides a professional appearance worthy of any situation and can be stored in a small 23 x 17" wide area against the wall. The Core DX's modest profile makes it ideal for using in small or large work areas and is virtually indestructible putting up with all the abuse you can dish out. White Polyethylene Core DX Multi Tasking Storage Cart offers an efficient way to sort, store, organize, lock and transport a wide variety of supplies with drawers, shelves, built in glove & tissue dispensers and bulk storage features. Constructed from tough, non-reactive white high density polyethylene, ABS and PETG this lab cart glides smoothly across most surfaces on its 4 heavy duty 3 inch non-marking rubber casters. The small footprint allows it to be stored securely and unobtrusively out of the way. White Polyethylene MRI Core DX Lab Cart offers a MRI safe, non-ferrous, efficient way to safely sort, store, organize, lock and transport a wide variety of supplies. 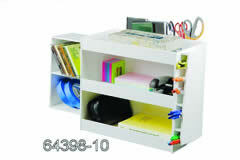 It has 3 full extension drawers, shelves and bulk storage features. Document and tool holder snaps on back. Constructed from tough, non-reactive polyethylene and ABS this lab cart glides smoothly on 4 heavy duty 3 inch non-marking rubber casters. The small footprint Core DX allows it to be stored easily out of the way. Push and Pull with comfortable built-in handles. White Polyethylene MRI Maui Lab Island 2 Foot Lab Cart offers flexible storage. It is constructed from white, nonferrous, durable, resistant, high density polyethylene and is designed for those who need a large amount of storage and workspace many carts don't offer. The integrated locking mechanism can be locked with the use of a padlock (not included) that keeps the tambour door securely locked in place until the lock is disengaged allowing the door to roll up and into the cart. Inside the MRI Cayman features a generous amount of storage space with a built-in shelf that lets you keep the supplies that you use most closest to your reach. Even fully loaded, the MRI Cayman can be easily maneuvered by one person with the aid of its 5 inch casters. Also available in a standard version (with metal). White Polyethylene MRI Cayman Lab Island 4 Foot Lab Cart is constructed from nonferrous, durable, resistant, high density polyethylene and is designed for those who need a large amount of storage and work space. The integrated locking mechanism can be locked with the use of a padlock (not included) that keeps the tambour door securely locked in place until the lock is disengaged allowing the door to roll up and into the cart. Inside the MRI Cayman Lab Island features a generous amount of storage space with a built-in shelf that lets you keep the supplies that you use most closest to your reach. Even fully loaded, the MRI Cayman Lab Island can be easily maneuvered by one person with the aid of its 5 inch casters. White Polyethylene Core DX Multi Tasking Storage Cart with Clear Door and extra shelf offers an efficient way to sort, store, organize, lock and transport a wide variety of supplies with drawers, shelves, built in glove & tissue dispensers and bulk storage features. Constructed from tough, non-reactive white high density polyethylene, ABS and PETG this lab cart glides smoothly across most surfaces on its 4 heavy duty 3 inch non-marking rubber casters. The small footprint allows it to be stored securely and unobtrusively out of the way. It features 3 full extension drawers and 6 side compartments, 2 with dispensing slots. A large bulk storage area with a locking sliding, clear PETG door secures supplies. The extra shelf in the bulk storage area is repositional to 3 different heights. 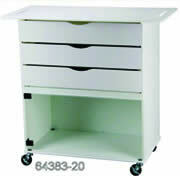 White Core Six Drawer Cart features 6 equally sized drawers (11.5 x 4.5 x 15.5 inches WHD). The built in locking mechanism locks all drawers with 1 key. The cart comes with 2 keys. 6 side shelf wings provide extra storage. Two of these wings include slots for dispensing gloves, wipes or other consumables. The rear mount tool holder holds tablets, charts and small tools. Built-in handles provide effortless movement on four 3 inch non marking rubber casters. Crystal clear front door and back panels offer a quick and easy view of all your supplies. 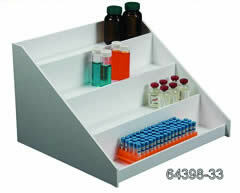 White Pipette Angled Bin Cart has 17 angled compartments that store, organize and transport supplies. Made from resistant and durable white ABS. The convenient angled storage bins makes it easy to see, stock and remove pipettes or other long items as needed. With 3 inch non-marking rubber casters and built in handles cut into the top, this cart is easy to move. 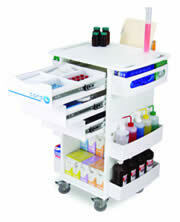 White Tall Slanted Suture Cart with Bulk Storage Area and Acrylic Door. The large bulk storage area is perfect for storing additional boxes of sutures, bottles of irrigation water or sterile suturing kits. Sitting atop 4 smooth rolling casters, it can easily be moved from an operating room to an exam room or to nearly any location where its services may be needed. Constructed of durable PVC. White tall tilted shelf cart with bulk storage area is able to secure supplies at a 45° angle on 8 slanted shelves for easy viewing and retrieval. The large bulk storage area is perfect for storing additional supplies. Sitting atop 4 smooth rolling casters, it can easily be moved from an any location where its services may be needed. White PVC Extra Wide Tall Slated Suture Cart with Bulk Storage Area provides 10 shelves that hold 100 standard suture boxes. It also includes an open bulk storage area for storing other supplies or additional sutures. The cart is made from a strong white PVC and sits on a polyethylene aluminum reinforced base to remain lightweight for easier transport. Also includes built in ergonomic handles on each side for pushing or pulling. White Polyethylene Extra Wide Compact Locking 4 Drawer Cart has 4 locking drawers and at 27 inches fits under most counters, tables, desks and benches. Push-pull handle is built in for easy mobility. Drawers are 3 inches deep. White Polyethylene Compact 4 Drawer Locking Cart has 4 locking drawers and at 27 inches tall fits under most counters, tables, desks and benches. Push-pull handle is built in for easy mobility. Drawers are 3 inches deep. White Polyethylene Locking 6 Drawer Procedure Cart has six 24 inch wide lockable full extension drawers and heavy duty industrial casters with brakes. The top is a 3 inch deep tray with a built in handle for easy pushing or pulling. This chemically resistant cart features sturdy polyethylene, ABS and PVC construction. Available in a variety of colors. White Polyethylene Tall Locking 6 Drawer Cart has a small foot print at 2 square feet, full extension drawers and heavy duty industrial casters with brakes. This cart features four 3 inch deep drawers and two 9 inch deep drawers. The top is a 3 inch deep tray with a built in handle for easy maneuvering. White Polyethylene Core DX Storage Cart with Security Railed Top offers an efficient way to safely sort, store, organize, lock and transport a wide variety of supplies with drawers, shelves and bulk storage features. The 2 inch tall 4 sided rail top keeps items on the top secure. Constructed from tough, non-reactive high density polyethylene and ABS this lab cart glides smoothly across most surfaces on its 4 heavy duty 3 inch non-marking rubber casters. The small footprint Core DX allows it to be stored easily out of the way. It features 3 full extension drawers, 6 side compartments, 2 with dispensing slots for Kleenex, Kimwipes or gloves. The Core DX also features a large bulk storage area with a locking sliding, clear, PETG door. Small Clear Acrylic Mobile Hazardous Waste Container. This 2 part cart rolls on a secondary secure container so it can be easily emptied. Constructed of sturdy ½ inch crystal clear acrylic ideal for hazardous waste including beta emitters. Standard hazardous material boxes fit this unit. The base has 4 industrial 2½ inch casters (2 with brakes) and hinged lid for easy opening and closing. Easy to move on secondary container with wheels. Standard waste boxes will fit this unit. Lab Trays are made from chemical resistant ABS. They are sturdy and clean looked in white color. They served all the needs around the lab by individually or insert to the lab carts. We offer a variety of trays for your drawers or to fill in 6-Drawer Cart (64405 series) and 7-Shelf Cart (64406 series). These trays can store and sort supplies of all sizes and shapes. Trays are made of ABS, color white, and chemical resistant. These handy trays can be used on their own, or with our Locking Roll-Top Carts (64382 and 64682-50). Each tray measures 14" x 10" x 3" (H). These deep trays with dividers, can organize your larger and bulkier supplies. They are constructed of bright white plastic with smooth surface. Available with three depths: 4, 6, and 8 inches, and with or without hinged clear lid. Measures: 17.5" (L) x 19.5" (W), with 4" (H), 6" (H) or 8" (H). This 4-slot drawer organizer is a simple way to organize your small items right in your desk drawers. Each tray measures 13" (W) x 1.75" (H) x 9" Deep. Two different sizes of storage for long volumetric pipettes and columns, each with adjustable dividers. Available optional with hinged lid with neon-red color. Made from HDPE, this adjustable tray comes with 28 separate compartments with a minimum size of 2.375 square inch. Four built-in handles make it easy to carry. Lid is available as optional. 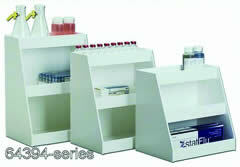 We try to offer different size's shelves to accommodate the needs of you laboratory. 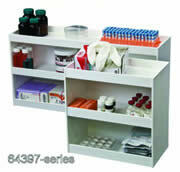 These shelves can be used for store, lab supplies as well as chemical, dyes, cleaning solution etc. 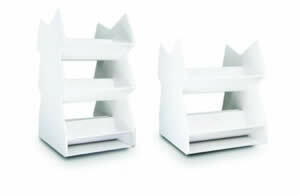 EMS is proud to introduce the New Tilted Safety Shelves in 4 different sizes. These innovative Tilted Safety Shelves add new options to store and organize supplies for easy access for the demanding environments of laboratories and hospitals with the fear of the supplies rolling or falling off the shelf. 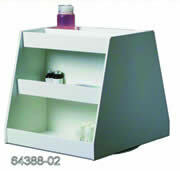 Bench top Tilted Safety Shelves are designed for saving space, secure storage and easy access. 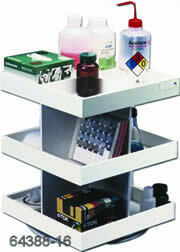 Specially designed tilted shelves let you securely and store boxes of supplies or other items within easy reach. Safety lip keeps supplies secure. This all-in-one shelf is a solution for de-cluttering your work-bench or lab desk. It comes with built-in compartment for pens or pipettes, small tools, equipment manuals, notebooks, CD's, along with shelves for small books, instruments, and open top shelf. This is compact and easy to clean reagent shelf. Ideal for storing indicators, acid, base, detergent as well as all the daily needed chemicals around the lab. The three-shelf unit has 12 – 6" square compartments. All shelves rotate full 360 degrees on a heavy duty turning mechanism. Single shelf can be used inside refrigerator. 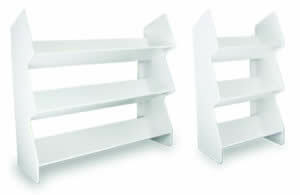 This multipurpose HDPE shelf can be mounted as either right side up or right side down depending on your desire. Additional, its feature draining holes in all four corners for mounted over the sink for drying purpose. Keyholes are spaced at 16" for stud anchoring. These shelves feature HDPE construction with remarkable roll-top door, which protect your supplies and enhance the appearance of the shelves. The door easily slide open and close. Shelves come with safety lips to keep the contents from falling off. Special designed fume hood shelves to offer addition storage space for your lab.